100% virgin low density polyethylene. Treated to allow for printing. Excellent for packaging products of varying lengths. Helps protect sensitive electric components from electrostatic discharge (ESD). Amine free interior. Requires heat sealer with cutter. 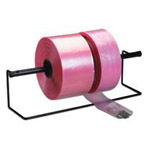 Poly Tubing - Poly Plastic Tubing, Pink, Anti Static, 2 mil.